With over 2/3 majority PACE supports proposals made by UEL chair Tiny Kox on how to meet future challenges of the Council of Europe. 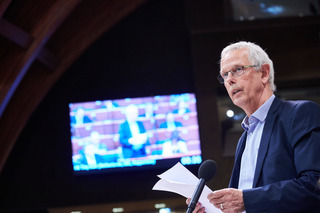 The proposals include a new strong multilateral reaction mechanism of the Parliamentary Assembly, Committee of Ministers and the Secretary General, in case of blatant violation by a member state of the COE’s Statute or the Human Rights Convention (ECHR). Kox’ proposals will now be on the table of the upcoming Ministerial Conference in May. The new joint mechanism could make not very effective unilateral sanctions of PACE and CM obsolete. The Assembly’s broad support for the Kox-report is seen as a major step in overcoming the political and financial crisis of Europe’s oldest and largest treaty Organisation which it is facing at the moment.